Privacy. According to The Oxford English Dictionary it is a state in which one is not observed or disturbed by other people. When we were young, we were taught that it is not polite to read over someone else’s shoulder. One might even be perceived as an intruder since reading is a very private matter, and reading over someone else’s shoulder could therefore be seen as a violation of privacy. According to Ted Striphas, author of The Late Age of Print: Everyday Book Culture from Consumerism to Control, the everydayness of this life’s lesson belies a complicated history of readers and reading whose intellectual origins can be traced back to classical liberalism (Striphas, 2010), a branch of liberalism which advocates civil liberties and political freedom with limited government under the rule of law (Dickerson, 2009). In The Gutenberg Elegies, Sven Birkerts is of opinion that the effort of engaging a book shows a desire to actualize and augment certain inner powers. According to him, reading is the intimate, perhaps secret, part of a larger project, one that finally has little to do with the more societally oriented conceptions of the individual (Birkerts, 1995). Thus, people attach great value to privacy when it comes to reading a book. But we have to ask ourselves: is privacy still possible in the digital age with multinational companies such as Amazon? Some time ago, Sun MicroSystems CEO Scott McNealy said that privacy is dead and that the public should deal with it (Strandburg and Raicu, 2006). Although he may have exaggerated, privacy in the digital age has become rare. The Amazon Kindle e-reader is a great example of the public’s disappearing privacy in the digital world. 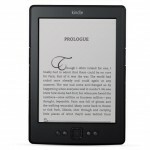 Ever since its November 2007 debut, Kindle has been very popular among e-reader users. There can be several reasons why Kindle is so popular: first of all, it presents itself as printed book-like and second of all, it provides for real-time communications between bookseller and consumer, because of its onboard 3G mobile phone technology. Readers can download the complete contents of any Kindle-formatted title directly to their units in less than a minute. Therefore, Kindle is very convenient for acquiring e-books and other types of digital content (Striphas, 2010). However, there is more to it than meets the eye, and that is its connection to Amazon.com. Kindle is a tethered appliance that ‘oblige you to enter into enduring relationships with corporate custodians, who make it their responsibility to manage the inner-workings of these devices’ (Striphas, 2010, 298). In other words, Amazon Kindle knows what kind of books you read, the way you read books and so on. Amazon possesses detailed personal information of Kindle users. But this is not seen as illegal since US federal law does not consider them as pieces of private information. And though Amazon keeps stating that it may transfer customers’ personal information to affiliate businesses in the event of mergers or acquisitions, it pledges that it sticks to the promises made in the Privacy Notice (Striphas, 2010). The problem, according to Ted Striphas, ‘stems from the practicalities of delivering on such promises when personal information flows from one large organizational, technological, or policy setting into the next’ (Striphas, 2010, 307). Amazon has become more and more a technology company, though it still perceives itself as an online retailer, a provider of things rather than being a maker of them. This could be a reason why Amazon may not realize the consequences of releasing Kindle onto the world and all the personal information of its users that come with it. But there is a lot of competition in the digital world, such as Apple, Barnes & Noble en Sony, so Amazon has no choice but keep up with the times and develop devices like Kindle since other companies move in the direction of wireless connectivity as well (Striphas, 2010). Tethering appliances will soon become indispensible. This would mean that even more detailed personal information will be available for multinational companies. I think we have to ask ourselves that in the digital age in which we actively participate through Facebook, Google, Amazon and so on, think of reading as a private matter and associate it with freedom. We sign up for Facebook to share stories and pictures with each other, we sign up for LinkedIn to share our resumes with each other, why is it then so important to us to keep our reading habits private? It’s the world of digital age and we’re just living in it, actively participating. Sven Birkerts. The Gutenberg Elegies: That Fate of Reading in an Electronic Age (1995): p. 81-90. M. O. Dickerson et al., An Introduction to Government and Politics: A Conceptual Approach (2009): p. 129-135. K.J. Strandburg and D.S. Raicu. Privacy and Technologies of Identity: A Cross-Disciplinary Conversation (2006): p. 348-350. Ted Striphas, ‘The Abuses of Literacy: Amazon Kindle and the Right to Read’, in Communication and Critical/Cultural Studies 7.3 (2010): p. 297-317. « Goodreads: share what you’re reading.